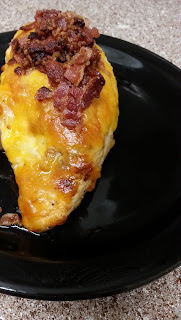 Bacon and cheddar combined make a flavorful chicken dish. Heat oven to 400 degrees. Spray cookie sheet with non stick cooking spray. Season both sides chicken with salt, pepper and garlic powder. Spread ranch dressing on each chicken breast and add cheese. Place on cookie sheet. Bake about 30 to 35 minutes, until chicken is no longer pink. Garnish with cooked crumble bacon.